Cooking with your children is a beautiful way to bond. Learning a new recipe together enriches your child, teaching cooking techniques and how to make smart, healthy choices. When you cook healthy meals with your child, you’re shaping their diet preferences for life. This weekend, try cooking every meal with your child. 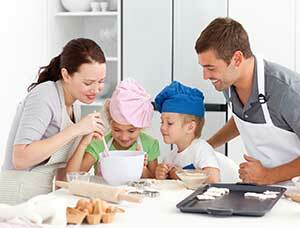 Teach them how to make healthy choices for every meal, trying out savory and sweet recipes, and even including dessert! Show your precious loves that healthy eating can be delectable, delicious, and delightfully fun! Time to celebrate the weekend! Start your days-off with a delectable dinner that’s festive and fun! Friday nights are for indulgence, and you can enjoy a delicious meal that is healthy. (30-40 minutes) This fresh twist on a longtime favorite is sure to delight and satisfy your child while maintaining healthy eating habits. Your weekend is off to an awesome start! Today, you’re going to be out-and-about, exploring together and creating new memories you’ll both remember forever! (5-10minutes) It is Saturday morning, and you want energy! This breakfast is light, fresh, and not too filling, so you can get the day started right. With this scrumptious breakfast, you’ll be ready to tackle all the adventures ahead! 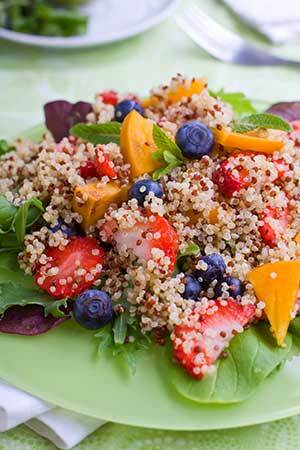 This Quinoa Fruit Salad & Whole Grain Toast w/ Apple Butter pairs perfectly with excited talk about your day ahead! (10 minutes) This healthy meal is perfect to store in Kangovou dishware and carry with you during your Saturday adventures. Perfect to prep after lunch and take with you, this Pesto Chicken Salad is fresh and crisp! This Pesto Chicken Salad pairs perfectly with a celery snack and a picnic in the park! (40-50 minutes) Another healthy twist on a fun favorite. With this meal, your kids will definitely enjoy eating their vegetables! A savory way to end an active saturday, this filling entree is sure to satisfy! 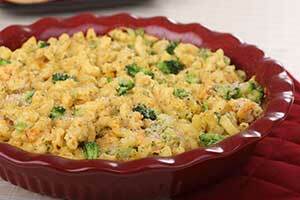 This Baked Veggie Mac-N-Cheese can be pre-prepared, frozen, and cooked on-demand. It pairs perfectly with family and sweet reminiscences of the day’s new memories. (5-10 minutes) This crisp sweet perfectly follows your warm, hearty dinner. Apple wedges are full of natural, healthy sugars that satisfy your child’s sweet-tooth without upsetting their stomachs or keeping them up late. These Apple Nachos pair perfectly with pajamas and an excited night of family board games! You’ve had an action packed weekend so far, and today is about family, rest, and relaxation! For this sunday, you’re all about decadent meals and family-friendly activity! (10 minutes) Sundays start slower. You’ve slept in, and now you want to have a warm breakfast to begin your day. These pancakes are healthier than their traditional counterpart: low-fat, with a focus on fruit. To get fancy, serve with a special syrup or a dollop of whip cream! 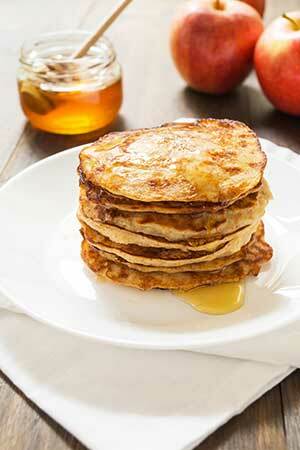 These Whole-Wheat Apple Pancakes pair perfectly with talking about last-night’s dreams. (5 minutes) This fresh, sweat meal is perfect to carry with you in Kangovou dishware. Take this yummy treat on a family hike, or family trip to the zoo. Fresh, fun, and colorful, this lunch will delight everyone! This Cinnamon Vanilla Granola pairs perfectly with nature, museums, and other enriching family escapades! (20-30 minutes) This classic meal always brings down the house! This delectible dinner is the perfect end to a weekend of healthy, fun cooking. After this, you’re sure to start your Monday healthy and happy! To get fancy, make your stir fry with beef tips! 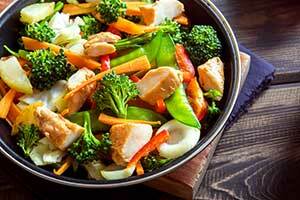 This Chicken and Veggie Stir Fry is perfect to celebrate the end of a weekend well spent!